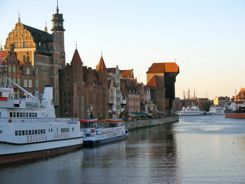 Gdansk could be your port of entry in Poland if you take a Baltic States or Northern Europe Cruise. It could also be your first stop if you enter Poland by ferry as we did. We arrived in Poland after a long overnight ferry ride from Nynashamn, Sweden. It was kind of a fun introduction because we were about the only non-Polish passengers on the ferry. Even hotels were marked in relatively easy to read signs. That's saying something because Polish is NOT easy to read! There is lots to explore, starting with just looking at the wonderful architecture of the Old Town. It's hard to believe that 90 percent of this city was destroyed or damaged in World War II. The buildings and churches have been painstakingly restored or rebuilt. Walk along the pedestrian walkway along the river front. This walkway, the Dlugie Pobrerze, hugs the Motlawa River bank. See the crane, the Zuraw, the largest medieval port crane in Europe (though this too has been reconstructed). You can view the riverfront best by walking over the bridge that is a continuation of the Long Street. Or take the small pedestrian ferry across in front of the crane. It's free if you have a ticket from the Maritime Museum that is housed in the Crane Building. Back on the town side of the river... Leave the river and pass through the Green Gate to stroll the Long Street... the Dlugi Targ and Dluga, its narrower continuation. It's also a pedestrian street lined with great buildings. Highlights are the Artus Court and the Neptune Fountain in front of it. The Uphagen House further down on Dluga has been recently restored, but it's 17th century Rococo paneling was not damaged in the war, and it's fun to see. Walk all the way to the end of the Ulica Dluga and go through the Golden Gate (we had to do this since we're from the San Francisco area!) and the Highland Gate. If you're so inclined, you can check out the Prison Tower and torture museum while you're there... or just pass through like we did! Browse the amber shops.... they're everywhere, but especially along the very pretty Ulica Mariacka. This street, Ulica Mariacka (ulica means street) runs parallel to Ulica Dluga. You reach it from a side street, or you can enter it through the Mariacka Gate on the riverfront. Like much of Gdansk, most of the buildings were rebuilt after WWII, but it contains outstanding examples of traditional Gdansk architecture. There are lots of churches to see. Most are historic, but they're comparatively plain inside because they were rebuilt. We didn't go to the shipyards, but signs of the Solidarity Movement were everywhere. You may drive in like we did, or you could take the train to arrive at the central railway station, Dwonec Glowny. It's a beautiful old building in its own right... a great introduction to the city's architecture. You may also find yourself arriving by air. The Lech Walesa Airport has become a destination for many low cost air connections from all over Europe. Maybe because Poland is still a bargain to travel in. There are also domestic flights from Warsaw or Krakow. 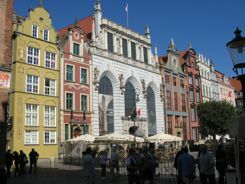 There are transfer buses to the central train station, which is right on the edge of the Old Town, about every half hour. No matter how you arrive in Gdansk, this pretty Baltic city is definitely worth a visit.